The role of B7/CD28 signals in Ag-induced cell cycle progression of CD4+ T cells was examined using the technique of CFSE dye dilution and flow cytometry. In wild-type T cells, proliferation was directly related to the concentration of Ag available to the APC. Consistent with this, the rate of G0→G1 cell cycle progression varied with the concentration of Ag. However, cell division by T cell blasts occurred at a constant rate, independent of Ag concentration. G0→G1 phase progression by CD28-deficient CD4+ T cells or wild-type T cells cultured in the presence of neutralizing anti-B7 mAbs was slowed, confirming that a synergy does exist between TCR and CD28 signaling in the initial activation of the T cells. However, unlike the TCR, the strength of CD28 stimulation was also shown to play a unique role in controlling the rate of cell division by T cell blasts. It remains uncertain how CD28 signals affect the progression of CD4+ T cells through cell cycle. Iezzi et al. (1) showed that the commitment of naive CD4+ T cells undergoing Ag stimulation to a proliferative response is significantly delayed in the absence of CD28 signals. Likewise, Gett and Hodgkin (2) found that CD28 costimulation decreases the mean time to first cell division, but thereafter has little effect on the rate of cell cycle progression. These results could suggest that CD28 signaling simply amplifies the early biochemical effects of TCR serial engagement, thus reducing the threshold for G0→G1 phase transition. In this study, we examined the role of B7/CD28 interactions during Ag/APC-induced cell cycle progression in CD4+ T cells, and specifically tested whether the elimination of CD28 costimulatory signals simply limits the downstream effects of TCR ligation. Our results demonstrate that CD28 costimulatory signals promote cell division independent of its effects on the initial TCR-induced G0→G1 transition. Six- to 8-wk-old DO11.10 TCR-transgenic mice were bred and maintained in our mouse colony (3). The CD28−/− DO11.10 mice were a gift from Dr. M. Jenkins (University of Minnesota, Minneapolis, MN). CD4+ T cells from these mice recognize chicken OVA peptide 323–339 (OVAp)3 (synthesized and purified within the Microchemical Facilities at the University of Minnesota, Minneapolis, MN) bound to I-Ad. BALB/c mice were purchased from Charles River Breeding Laboratories (Wilmington, MA) through a contract with the National Cancer Institute at the National Institutes of Health (Frederick, MD), and were used as a source of APC. CD4+ T cells were positively selected from DO11.10 lymph node and spleen single-cell suspensions using a CD4 mAb magnetic-bead separation system (Dynal, Lake Success, NY), achieving a purity of 90–95% KJ1-26+CD4+ T cells. Before culture, CD4+ T cells were labeled with 2.5 μM CFSE (Molecular Probes, Eugene, OR) in PBS for 10 min at 37°C, and then washed into complete medium (RPMI 1640 (Celox, Hopkins, MN) containing 10% FCS (Sigma-Aldrich, St. Louis, MO), 2 mM l-glutamine, penicillin, streptomycin, and 5 × 10−5 M 2-ME). CFSE-labeled DO11.10 CD4+ T cells were stimulated in vitro with OVAp-loaded, LPS-treated (10 μg/ml; Sigma-Aldrich) adherent spleen cells at a 10:1 T cell to APC ratio at 37°C in complete medium, as previously described (4). At the time points indicated, an aliquot of cell culture was removed and events were collected with a FACScan (BD Biosciences, Mountain View, CA) and analyzed using CellQuest Pro (BD Biosciences) or FlowJo (Tree Star, San Carlos, CA) software. In some experiments, 500 nM rapamycin (RAPA) was added to the cultures, with the vehicle alone (ethanol) used as a negative control. To inhibit B7/CD28 costimulatory interaction between the T cells and APC, the APC were preincubated with 20 μg/ml hamster anti-B7-1 mAb 16-10A1 (BD PharMingen, San Diego, CA) and rat anti-B7-2 mAb GL1 (American Type Culture Collection, Manassas, VA) for 1 h on ice. Hamster IgG and rat IgG2a were used as irrelevant Ab controls in the experiments. Anti-B7-1 plus -B7-2 consistently blocked Ag/APC-induced IL-2 production >75%. Freshly isolated OVA-specific DO11.10 CD4+ T cells were labeled with CFSE, and then cultured in vitro with syngeneic APC and increasing concentrations of OVAp. At each time point examined, there existed an inverse relationship between the amount of OVAp added and the number of G0-phase resting T cells (FSClow, CFSEhigh) that remained in culture (Fig. 1⇓A). 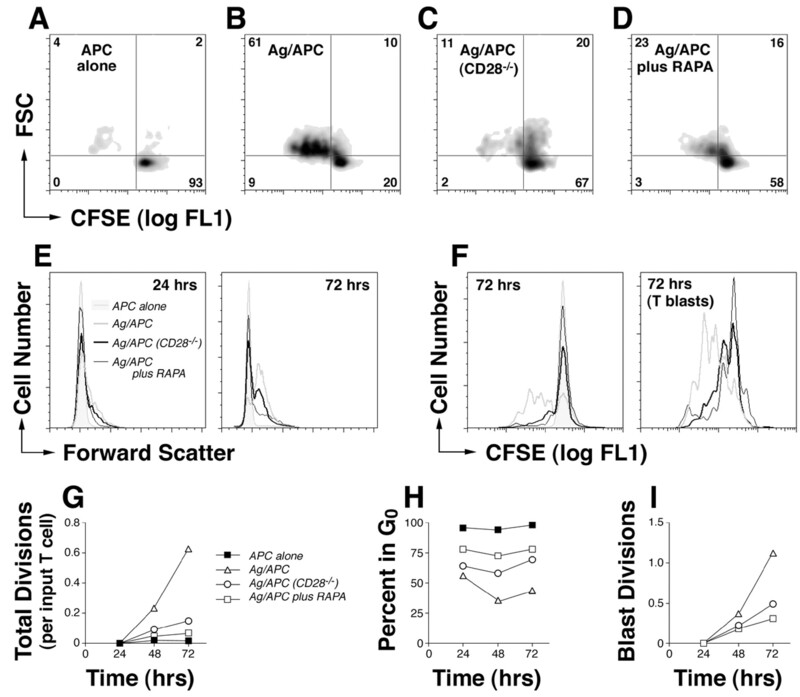 An analysis of the FSC histogram suggested that, at any given time, both the frequency of T cells undergoing blastogenesis and the size of the blast cells were increased with higher Ag concentration (Fig. 1⇓B). Despite this relationship, increasing the concentration of Ag in culture from 0.2 to 20 μg/ml did not demonstrably affect the pattern of cell divisions that occurred within the FSChigh T cell blast population (Fig. 1⇓, A and C). Peptide Ag dose determines the number of CD4+ T cells that undergo blastogenesis, but not the number of times the blasted cells divide. 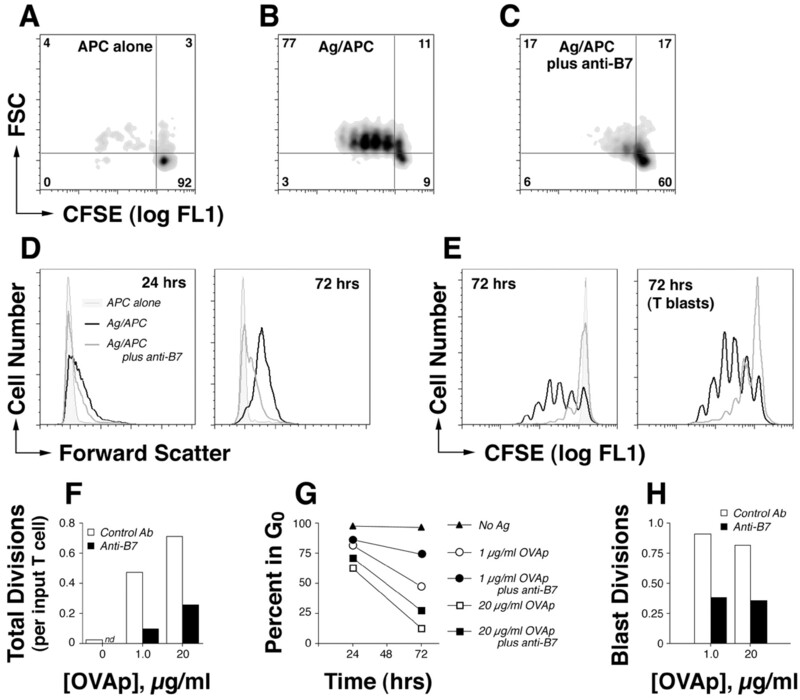 A–C, CFSE-labeled DO11.10 CD4+ T cells stimulated with APC and the indicated OVAp concentration for the amount of time shown. In C, all live cells are shown on the left, whereas FSChigh blast T cells are shown only on the right. D, Total divisions per input T cell for cells stimulated as indicated. E, The percentage of T cells remaining in G0. F, The average number of cell divisions by blasted T cells. Groups in E and F were stimulated as indicated in D. Cells shown in the two-dimensional plots (A) were collected in a single experiment. Cells shown in the histograms (B and C) were from a second experiment. Data collected in a third experiment were used for D–F. Note that too few blast cells were identified in the “No Ag” group to allow for analysis in C, right, and F. This experiment was repeated with similar results a total of five times. Although the concentration of OVAp did not appear to regulate the kinetics of cell division in the culture, the absolute rate of cell division between 48 and 78 h (as indicated by the slope of the curve in Fig. 1⇑D) was directly related to the amount of Ag. As predicted by the flow cytometry plots, the number of G0 T cells that remained in culture decreased over a 72-h period in a fairly linear fashion (Fig. 1⇑E). This rate of decrease was again directly related to the OVAp concentration, with higher Ag concentration associated with a steeper fall in the percentage of G0 cells remaining in culture. Cell divisions among blasted T cells occurred at a relatively constant rate between 24 and 72 h (Fig. 1⇑F). Remarkably, there was no relationship between the concentration of Ag and the number of divisions calculated per blast cell. Thus, this examination of blastogenesis and CFSE dye dilution determined that the concentration of Ag available to the CD4+ T cell regulates its rate of G0→G1 cell cycle progression. At low Ag concentration, the time to first division is delayed within the whole population because of a slower rate of cell cycle entry. However, once a T cell has successfully undergone a blastogenesis in response to Ag and APC stimulation, multiple cell divisions can occur independently of the strength of TCR signaling. To address the question of where in the cell cycle CD28 signals act, CD28-deficient DO11.10 CD4+ T cells were examined in this culture system. As shown in Fig. 2⇓, CD28-deficient T cells were defective for cell cycle progression in response to challenge with Ag and APC. In fact, the rate of cell divisions between 24 and 72 h was only approximately one-third of that measured for wild-type T cells (Fig. 2⇓, C, F, and G). At closer inspection, it appeared that at least part of this defect resulted from a lowered rate of G0→G1 phase progression in the CD28−/− CD4+ cells (Fig. 2⇓, E and H). Interestingly, the effect of CD28 deficiency on blastogenesis was relatively modest during the first 24 h of culture, but became more marked at later time points. Perhaps most importantly, cell division by blasts was also reduced by >50% in the absence of CD28 costimulation (Fig. 2⇓, F and I). Unlike Ag dose, CD28 costimulatory signals regulate both the frequency of blastogenesis and the rate of cell division. Wild-type DO11.10 CD4+ T cells were cultured for 72 h with APC alone (A), 10 μg/ml OVAp/APC (B), or 10 μg/ml OVAp/APC plus 500 nM RAPA (D). In C, CD28−/− DO11.10 responder CD4+ T cells were cultured for 72 h with 10 μg/ml OVAp/APC. E, FSC profiles for the indicated T cells and their stimuli at the times shown. F, CFSE fluorescence of all live CD4+ T cells (left) or of FSChigh blast T cells (right) after 72 h, stimulated as in E. Calculated total divisions per input T cell (G), percentage of T cells remaining in G0 (H), and mean divisions per blasting T cell (I), with stimulation as shown in G. Note that too few blast cells were identified in the “APC alone” group to allow for analysis in F, right, and I. This experiment was repeated three times with essentially similar results. This requirement for a unique CD28 signal (that cannot be mimicked by other costimulatory receptor/ligand pairs expressed on the APC) to achieve a maximum rate of cell division by responding T cell blasts does not indicate a simple additive effect of CD28 signaling with that of the TCR, because variations in the strength of TCR signaling did not affect the rate of cell division by blasts. Rather, it suggests that CD28 signals regulate cell cycle progression in a manner independent of TCR signal strength. This was found to be similar to the capacity of the mammalian target of RAPA inhibitor RAPA to block cell cycle progression by wild-type T cell blasts independent of any effects on TCR-induced blastogenesis and growth factor production (Fig. 2⇑ and data not shown). To further investigate the relationship between CD28 costimulation and strength of TCR signaling on cell cycle progression, wild-type DO11.10 CD4+ T cells were stimulated with APC and increasing doses of OVAp either in the presence or absence of neutralizing anti-B7-1 and -B7-2 mAbs. B7 blockade limited cell cycle progression in Ag-stimulated cultures, reducing the total number of cell divisions observed (Fig. 3⇓, A–E). Again, this inhibition appeared to result from both a decrease in the number of blast cells generated at any given concentration of Ag, and a decrease in the number of cell divisions that any blast cell underwent. Neutralization of B7-1 and B7-2 does not mimic the effect of lowered Ag concentration. DO11.10 CD4+ T cells were cultured for 72 h with APC alone (A), 20 μg/ml OVAp/APC (B), or 20 μg/ml OVAp/APC plus anti-B7-1 and -B7-2 mAbs (C). FSC (D) and CFSE (E) profiles of T cells were stimulated for the times shown as indicated in D. F–H, Total divisions per input T cell, percentage of T cells in G0, and the average cell divisions among T cell blasts for low (1 μg/ml) and high (20 μg/ml) doses of OVAp either with or without anti-B7 mAbs as indicated. Cells shown in A–E were from a single experiment. Cells in F–H were from a second independent experiment. This experiment was repeated a total of six times with similar results. By titrating the amount of Ag, it was observed that the inhibitory effect of the anti-B7 mAbs was qualitatively different from the effect of reducing the Ag concentration (Fig. 3⇑, F–H). OVAp (20 μg/ml) induced fewer total cell divisions in the presence of anti-B7 mAbs than was seen in the absence of Abs at the 1 μg/ml dose of Ag. Nevertheless, B7 neutralization had less effect on G0→G1 phase progression than the reduction in Ag concentration. As before, this reduction in Ag did not influence the rate of cell division among the blast cells. In contrast, anti-B7 mAbs reduced this rate by more than half. Thus, B7/CD28 interactions do play a significant albeit limited role in Ag- and APC-induced CD4+ T cell blastogenesis, even when additional costimulatory ligands are available on the APC. The inhibitory effects of the anti-B7 mAbs on blastogenesis are particularly apparent at later time points after stimulation, and this may reflect the unique capacity of B7/CD28 interactions to promote the production of autocrine growth factors such as IL-2. In addition to this synergistic effect of TCR occupancy and CD28 costimulation on blastogenesis, B7/CD28 interactions also appear to regulate the rate of cell division by T cell blasts independent of the strength of TCR signaling. In a previous study by Lee et al. (6), it was shown that the stimulation of CFSE-labeled DO11.10 CD4+ T cells with APC and OVAp for as little as 2 h could be sufficient to induce their activation and continued proliferation of the T cells, even after the removal of Ag. They suggested that an early “programming” of the T cells occurs in response to TCR signaling, and leads to subsequent Ag-independent cell divisions. In their experiments, the Ag dose controlled the percentage of cells that became activated (based on CD69 and CD25 expression, and onset of cell division), but did not affect the rate of subsequent cell divisions. Our results are consistent with these previous findings, here using blastogenesis (FSC increase) as a marker of activation during Ag stimulation. When taken together with these previous data, our finding that B7/CD28 interactions (evidently early on in culture) can regulate the rate of cell division by blast CD4+ T cells implies that an inhibitory checkpoint for cell cycle progression can be eliminated for the duration of the “programmed” clonal expansion. Our demonstration of a unique role for B7/CD28 interactions in the regulation of cell cycle progression is seemingly inconsistent with results from Gett and Hodgkin (2). Their analysis of cell cycle progression using naive fresh CD4+ T cells suggested that CD28 signals have only an additive effect with the TCR, and they challenged the entire notion of a two-signal model for T cell proliferation in which costimulatory signals play an obligatory role for proliferation. However, several features of their experimental system may have contributed to their inability to observe an independent effect of CD28 signaling on cell division. First, their use of mAbs (anti-CD3 and anti-CD28) as stimuli prevented other APC-derived costimulatory ligands from participating in the activation of the T cells through their Ag receptors. The APC used in our experiments are spleen-adherent cells that have been activated overnight with LPS and, therefore, can be expected to express a wide array of costimulatory ligands in addition to B7 family molecules. Their mAb system may consequently rely more heavily on CD28 for the early activation of the T cells, thus obscuring any additional requirement for CD28 in G1→SG2M phase progression. Secondly, their experiment made no attempt to separate early G0→G1 activation (blastogenesis) from mitosis. The most compelling data shown here relied on an examination of cell cycle progression solely within the blasted subpopulation. Finally, their use of recombinant IL-2 in all of their cultures allowed for a potent exogenous stimulus for the proliferation of CD4+ T cells activated with CD3 and CD28 mAbs (our unpublished observation). This intense proliferative stimulus likely alleviates any normal requirement for CD28 signals to regulate the rate of cell division via the enhancement of autocrine growth factor production. Results obtained in this study using Ag/APC instead agree with the previous observation by Gudmundsdottir et al. (7) that DO11.10 T cells responding to OVAp (defined as those cells that have completed at least one round of cell division) demonstrate a slowing of the doubling time by 2-fold following neutralization of the available B7 molecules. In vitro, clonal anergy induction has been shown to occur in CD4+ Th clones following TCR/CD3 ligation that is unaccompanied by strong CD28 costimulation (8). This capacity of CD28 to control the development of anergy may relate to its ability to increase the synthesis of autocrine growth factors such as IL-2, and enhance the rate of growth factor-dependent cell cycle progression. Consistent with this, previous in vitro experiments have demonstrated a down-regulation of T cell Ag-responsiveness following activation in the presence of G1-phase cell cycle inhibitors (9, 10). Our recent in vivo examination of CD4+ T cells that had previously been activated by Ag indicated that clonal anergy develops in those T cells that fail to undergo a cell cycle progression sufficient to reverse a clonal anergy state that invariably develops following TCR stimulation (11). Inhibition of cell cycle progression during exposure to Ag using RAPA promoted anergy induction, whereas enhancement of cell cycle progression through the administration of anti-CTLA4 mAb antagonized the development of anergy. Experiments in this study support the model that CD28 ligation provides a second signal that regulates cell cycle progression independently of its effects on early TCR signaling. These data imply that costimulatory ligands other than B7-1 and -2 may be sufficient to allow for effective TCR serial engagement that leads to at least partial activation of the T cell. In the absence of CD28 engagement, this TCR signaling is sufficient to induce the clonal anergy state but cannot ensure sufficient G1→S phase cell cycle progression to eventually restore the Ag responsiveness. ↵1 This work was supported by National Institutes of Health Grants R01 GM54706 and P01 AI35296 (to D.L.M.). In addition, J.L.B. was a National Institutes of Health Immunology Predoctoral Training Grant recipient (T32 AI07313). ↵3 Abbreviations used in this paper: OVAp, chicken OVA peptide 323–339; FSC, forward scatter; RAPA, rapamycin.